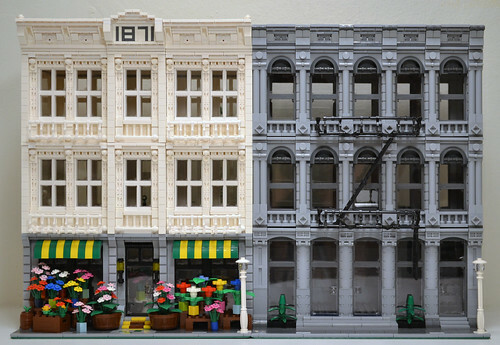 Brick Town Talk: Back From The Dead - LEGO Town, Architecture, Building Tips, Inspiration Ideas, and more! Apology Avenue - (BTT) It's been a looong time. Far from being abducted by aliens or going on a secret government assignment to save the world from some genetic experiment gone wrong, alas these two months off are for a far less worthy reason - I've been busy playing with plastic bricks. I'm guessing I'm not alone, though. What started as one week off turned to two turned to many more, and I do humbly apologize for the complete lack of updates. I know many of you have been checking in regularly only to leave without your Lego architecture fix, and to that I say sorry and thank you for your patience. As a small consolation, I submit below a peek at my own latest creations - two cast iron inspired modulars that those who live in or around the NYC area can currently see in the flesh by visiting the Lego Store at Rockefeller Center - they should remain there through November. These were originally done as part of ILUGNY's stunning display at the recent New York Comic Con, but sadly only the grey one was ready in time. If you created a stunning project that you feel was unfairly ignored in the BTT hiatus, or if you want to nominate someone else's work for consideration, please email me, send me a flickr mail, or just respond to this topic. Again, thank you all for your continued support - it really is appreciated. Yesss ! BTT is back !!!! Welcome back (Phew!). Beautiful cast iron buildings. Sure hope Lego® adopts cast iron into its modular series! No worries, thanks for doing this!! !